THE ESSENTIAL WARLOCK Vol. 1 (cover by Gil Kane, all rights reside with current holder) reprints two different series that both push the envelope for Bronze Age comics (though the second series is far superior to the first), and led to Adam Warlock rising from an obscure two-shot character to a Marvel A-lister. 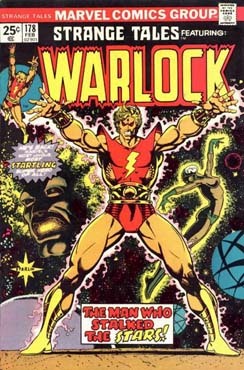 Adam Warlock first appeared as Him, an entity created by the Enclave scientific cabal in Fantastic Four #66 (which is not part of this TPB). Unwilling to be the Enclave’s puppet, he blew them up, then headed off to find his destiny … which turned out to be trading punches with Thor in hopes of mating with Sif. That could easily have been the last we saw of Him; instead, Roy Thomas and Gil Kane turned Him into the offbeat hero Adam Warlock in the debut issue of Marvel Premiere (which is where the TPB starts). The premise: Marvel super-scientist the High Evolutionary decides rather than merely super-evolve animals, he’ll evolve a new Earth. On the far side of the sun, he creates Counter-Earth, exactly like ours except its human race will never know violence, hate or crime. But after six hours creating the world, the Evolutionary rests. Enter his previous creation, the evil Man-Beast, who compels Counter-Earth humanity to re-enact all Earth’s bloody history (with the exception, we learn later, that there are no super-heroes). High Evolutionary contemplates destroying his fallen world—but Him, whom the H.E. found floating in space, offers to redeem Counter-Earth from the Man-Beast’s corruption (why yes, it was a religious allegory). The H.E. named his protege Warlock for his powers; a woman on Counter-Earth named him Adam because he was so clearly the first of his kind. 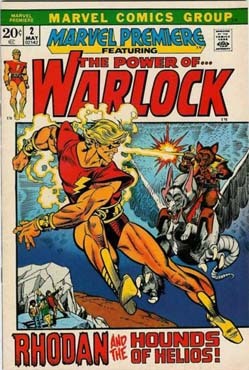 Warlock-as-Jesus got his own series, with Thomas, Mike Friedrich and SF writer Ron Goulart writing various issues. 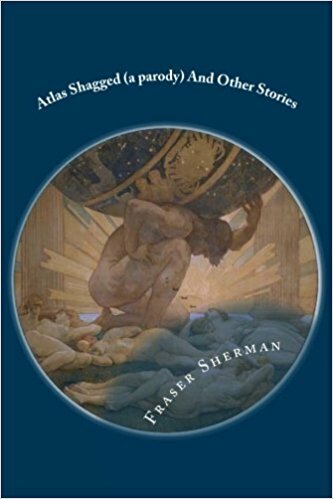 It was interesting, but uneven (Friedrich is a poor writer, though his Warlock stories were better than his average) and the efforts at Deep Thoughts were often clunky. After eight issues, it folded, though Thomas wrapped things up in Incredible Hulk, where Jade-Jaws lands on Counter-Earth and helps Warlock defeat Man-Beast (including a death-and-resurrection sequence). Warlock then headed out into space to seek out other worlds where the Man-Beast’s influence might be lurking. As a kid this series blew me away. Starlin tackled religion, freedom, rebellion and destiny and did it well and comics really didn’t tackle that sort of thing (let alone do it well). There was great art (strongly influenced by Steve Ditko at times), fun characters, dark twists and a really startling but satisfying ending. Rereading the run it’s a little less impressive — it isn’t as far beyond the envelope now as it was then, and some of Starlin’s insights aren’t so deep — but it’s still a wild ride. The ending of Starlin’s run is just perfect, but unfortunately he undid it years later and ushered in the tedious Infinity Gauntlet and its endless Infinity sequels (I haven’t liked any of Starlin’s work since the mid-eighties). But the Essential Warlock? He’s worth the reading.